If the No. 1 Kennedy volleyball team's home victory over the No. 7 Portland Christian Royals on Thursday is any indicator, the only team that can beat the Trojans is themselves. That was head coach Laura Beyer's takeaway after the Trojans controlled a top-10 Royals team for a 3-1 victory (25-15, 19-25, 25-13, 25-18), controlling most of the game, but giving Portland Christian an opening in the second set due to uncharacteristic service errors on Kennedy's part. "We struggled with some serves tonight, which usually isn't a part of our game that we have to worry about," Beyer said. "It shows that we cannot beat a good team if we're going to miss that many serves." The contest was an unexpected boon in the middle of the league schedule — an opportunity to play a highly-ranked opponent outside of a tournament setting. The Royals (12-3, 7-0 Northwest League) entered the game with a strong resume, winning 10 of their previous 11 games, with their only loss coming against the 3A No. 6 Salem Academy Crusaders. Portland Christian regularly ranks among the top contenders to make it to the state quarterfinal tournament, and the Trojans (18-1, 9-0 Tri-River Conference) were eager to see a potential playoff preview against a team they had not yet faced this season. "This was a huge game, because we haven't seen each other," Beyer said. "Both of us are undefeated in our league. We've both been to different tournaments and done well. So it was the game of the year so far. I'm sure we will see them again." The Royals came out with their best foot forward, putting Kennedy behind 7-2 in the first set before the Trojans reeled off eight of the next nine points to take a 10-8 lead. After trading points, the Trojans ripped off seven straight points to go up 19-11, withstood a small rally by the Royals and finished off the set with four consecutive points to win 25-15. "What we did well tonight is we blocked well and we hit well," Beyer said. "We picked it up on the other end. We turned it on offensively at the net and played really, really well." But the Trojans left room for the Royals to mount a comeback in the second set. Portland Christian again built an early lead, 4-1, and Kennedy again stormed back to retake the advantage, 11-8. This time, however, Kennedy could put another rally together. Every time the team controlled the ball, the Trojans were quick to give possession back to the Royals, unable to serve as crisply as the team had done all season. Portland Christian was quick to take the que and won nine of the final 12 points to tie the game at 25-19. 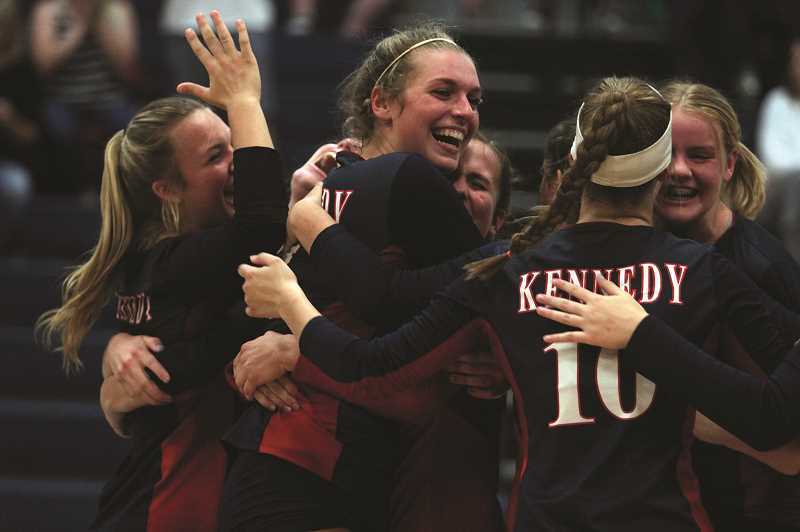 "Missing all those serves- that's what let them back in the game," Beyer said. "Volleyball is like that. To me, a serving mistake is a mental mistake, and you cannot make those mental mistakes." While Kennedy's service woes did not entirely go away, the Trojans did enough to mitigate the errors in the final two sets. The team took an 8-1 lead to open the third set and after enduring a run by Portland Christian to make it 13-9, the Trojans went 12-4 down the stretch to win 25-13. In the final set, the Royals held a 13-10 lead before Kennedy stormed back, winning the final six points to secure the victory 25-18. The win kept Kennedy undefeated against Oregon opponents. Kennedy's lone loss of the season came 2-0 against Kings Way from Washington in the first round of the Trojans' home tournament during Oktoberfest. 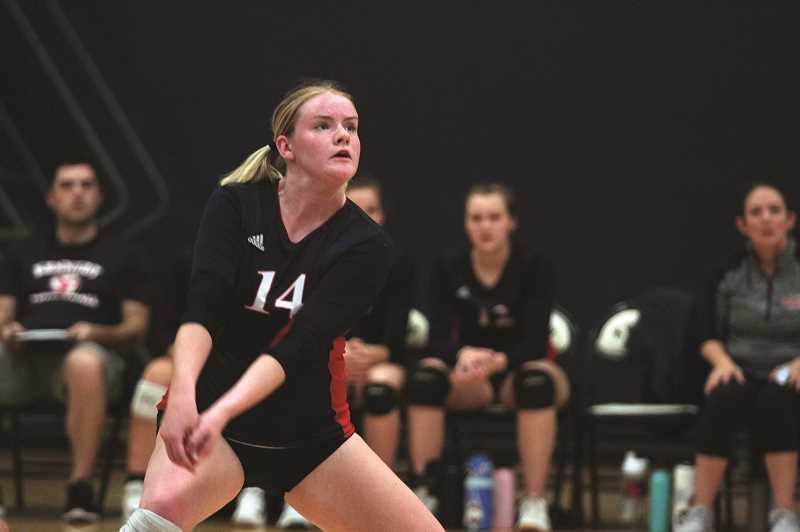 While the Knights are one of Washington's best small school programs — winning the 1A state title the year before — Kennedy was without First Team All-State hitter Hallie Sprauer, and Beyer believes her presence made the difference in the final result. The team had previously won a tournament at 4A Cascade with Sprauer and rallied to win a 3A tournament at Salem Academy the week after. "If we would have had Hallie the weekend of Oktoberfest, we would have won our own tournament," Beyer said. "I think she would have pushed us over the top." Sprauer was absent for a week and a half due to injury, returning to the team last week. Although Beyer is certainly happy to have one of the best hitters in the state back in the lineup, Sprauer's absence allowed Beyer to lean on the team's depth, giving them ample playing time in the Salem Academy tournament that she's hoping will pay off later in the season. "There wasn't a player we didn't use in that tournament," Beyer said. "We were spreading around offensively with our other outside hitters — Elise, Sophia, Kelsey, Kalyssa — it was a more balanced offense when she was out. It was a very good experience for our whole team." Sprauer's return to the lineup comes just in time for the final stretch of the season and the Trojans' showdown the No. 4 Culver Bulldogs (20-2, 10-0), whose lone two losses come against 1A No. 1 St. Paul. The two teams were scheduled to play in Kennedy on Tuesday and will face each other again in Culver on Oct. 10. And with both teams running away with the league, it would be a monumental surprise if the two teams didn't meet in the conference title game at the end of the month. "I would pick us to win as the favorites," Beyer said. "They lost their setter last year, who was phenomenal. We are very balanced, and we have a lot of offensive weapons."